I spend a lot of time in reading books. That is one big hobby that I have. (it suits my introvert nature very well). One is going on buying books and another is to keep tracks of the books in your shelf. Well, so far I didn’t have any success. I even thought of building an application for it (for lack of time it has not progressed). Today via Tim O’reilly’s tweets, I came across someone who already built an online bookshelf in Shelfari. As soon as I read about it, I immediately created an account and added few books. Its a cool service. Once you add a book, it pulls the information from Amazon (and may be other sites as well), and catalogues the books. But that isn’t cool. It builds a beautiful bookshelf kind of structure online. You can add books that you already have, you are reading, you plan to read and so on. So it becomes a comprehensive book catalogue. A nice good effort. It also allows to download the book’s list in an Excel file. 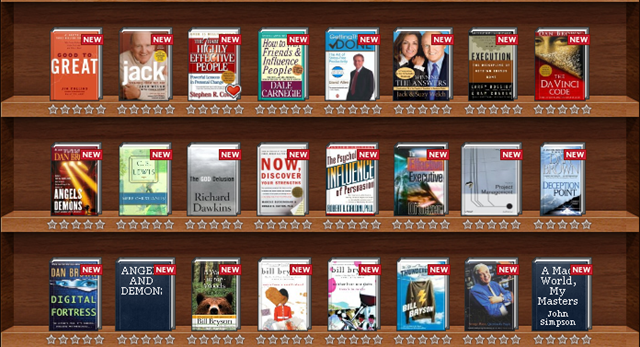 Check out my online bookshelf. In case you create one, invite me.